Thousands of people, almost 300,000 in 2016, travel each year the various routes that compose the Camino de Santiago in which people moved by religious motivations are mixed with others seeking to free their mind, reconnect with nature or an alternative way to know Spain and the richness of its territories and landscapes, surrounded by an international environment. From the request of a friend and with the collaboration of Adriana Jaquelin López Neto, student of the Simón Bolivar University of Caracas, who was developing in that period an internship and work of her degree thesis in Ctrl+Z., the proposal of a prototype that could be installed in a reversible form in different points of the pecuniary ways that constitute the “Ruta de la Plata” is developed. The “Ruta de la Plata” is the main path from the south of the peninsula and is characterized by large distances between populations and extreme temperatures in summer. The possibility of building different hostels in the stretches that, being further away from the towns, present a certain lack of services, was detected. The idea is concretized in the “Albergue del Buen Camino” project, which consists of a unit of 125 m2 built surface, with the capacity to lodge a total of eight pilgrims. Different units have the possibility of being grouped around a distribution space, a central square for recreation, social interaction and rest. The hostel has been designed in “superadobe” a construction technique easily appropriable and replicable, very robust and based on a natural and abundant material as it’s the earth. The design is thought for the incorporation of passive strategies and to be able to adapt to the different locations where it can be installed, always caring for the orientation of the internal spaces and of the energies self-sufficiency means that will accompany each hostel. 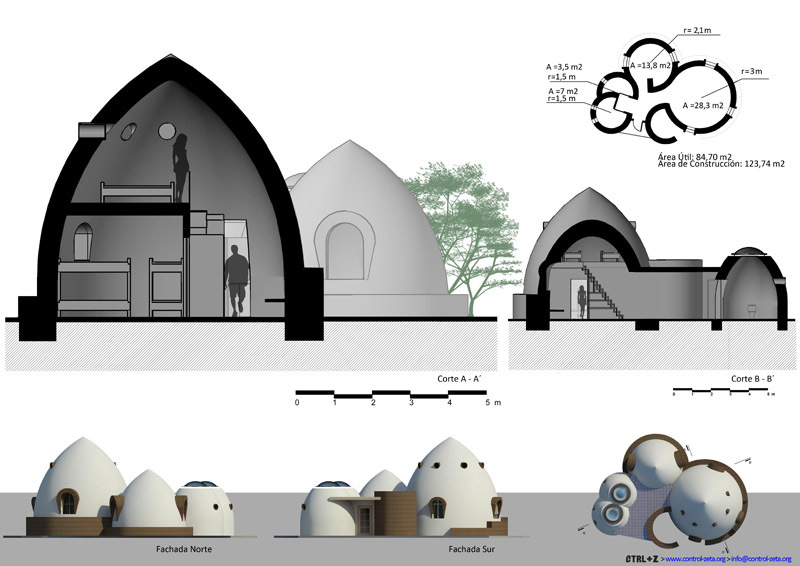 The architectural proposal is organized on the basis of the specific and peculiar needs of the users of the hostel: Camino de Santiago‘s pilgrims. 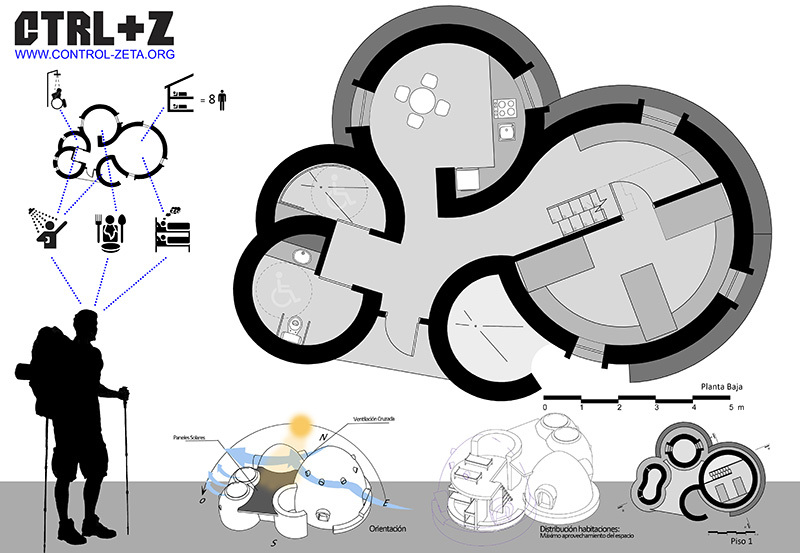 A fluid space in which the location of the access is located at the intersection of the three domes that make up each unit is created in order to provide an efficient and intuitive circulation within it and from the moment of arrival at the hostel. An application would manage the guests of each hostel from reservation to payment, so that they can plan their route from their cellphones according to availability. Although different factors did not allow at the time to advance with the development of the proposal and to build a pilot project, the current situation and the continuous increase of pilgrims who travel the Camino encourages more and more people to show interest in building and managing a hostel near their villages as a means for creating fair and local employment. This entry was posted on Saturday, February 22nd, 2014 at 5:44 pm. It is filed under ENGLISH. You can follow any responses to this entry through the RSS 2.0 feed.